Known for being the culinary capital of the Philippines, Pampanga is mostly associated with delectable Kapampangan dishes and cuisine that people would rarely correlate it with anything else but food. However, unbeknown to tourists (and sadly, some Filipino travelers as well) Pampanga is also known for its rich and vibrant history. It has several heritage sites and a variety of historical structures that would all allude to its historical and intriguing past and culminate into a better understanding of what the Philippines really is. A province located up north, Pampanga got its name from the word “pampang” or “pampangan” which translates to “river bank”. 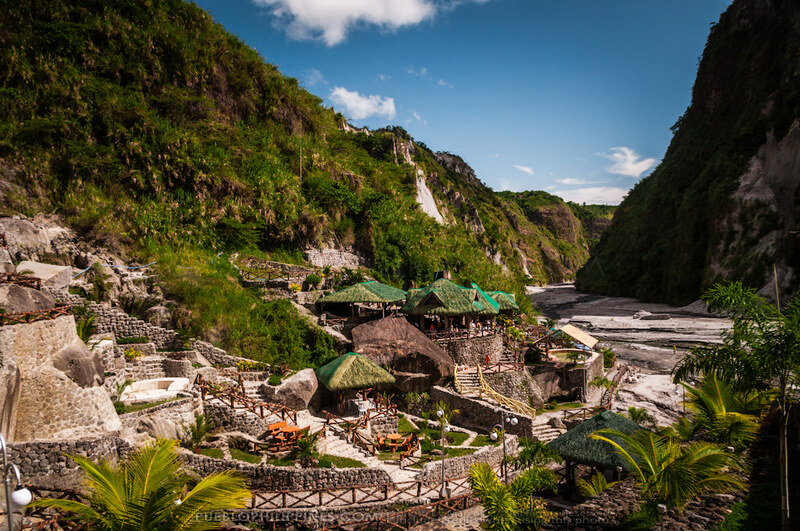 A rich and fertile valley in Central Luzon, this Philippine province has a lot to offer to locals and tourists alike. It should come as no surprise that the province would be somewhat of a foodie’s haven given the province’s selection of unique and delectable cuisine and food items. However, dining and food aside, Pampanga is worth the visit because it is rife with a myriad of things to do that you would hardly get bored. In fact, you can fill a three-day travel itinerary with the activities you can do in the province. From a slew of churches, amazing festivals, and thrill-seeking activities, there is so much to do in Pampanga. So, if you are looking for a glimpse of what the life up north is like, you might just want to take a trip to the dubbed culinary capital of the Philippines—and not just to sample their food but to experience the province as a whole as well. 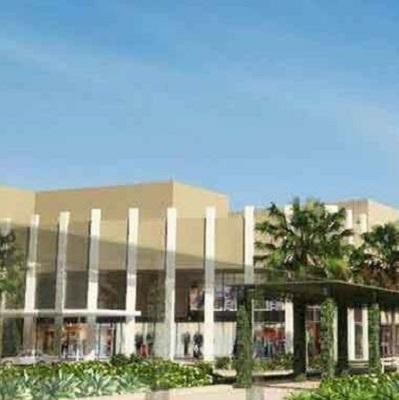 You have four options in getting to Pampanga from Manila. If you are taking your own car, the drive approximately takes an hour and a half to a couple depending on traffic. However, if you do not wish to be encumbered by driving duties, you can reach Pampanga by bus or taxi. If you want to turn your spontaneous trip into a full-blown road trip excursion, it is best to take your car. Apart from getting there faster and easier, it also allows you to explore more places without having to pay the standard fares. If you are driving, all you need is to travel up north from Manila and drive through the R-8 route which unfortunately is the fastest route of all the available ones despite the traffic lockup. Pay the necessary toll fees and arrive in San Fernando, Pampanga. Typically, taxi drivers would charge you more than what the standard taxi meter would reflect on your trip. This is because Pampanga is located outside Metro Manila and if they have to brave through the traffic, they might charge you more. Alternatively, you can take a Grab car going there, but the fare would more or less be the same. Taking the bus is much cheaper, and you have a myriad of options to choose from. Some of the buses that pass through Pampanga are Victory Liner, 5 Star Buses, etc. 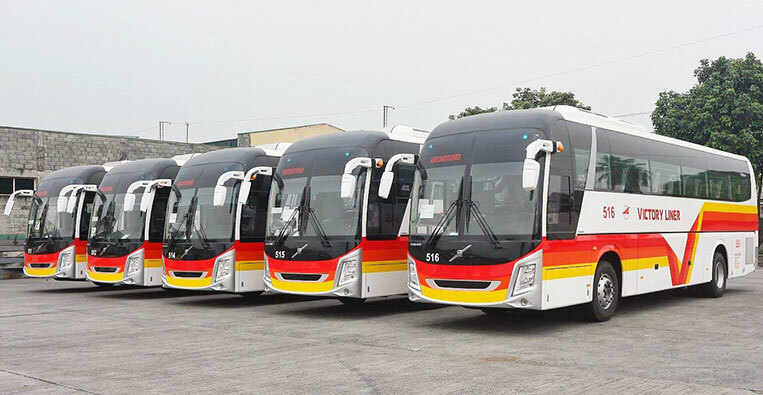 Bus fares would range from 150-300 pesos per passenger depending on the type of bus and your bus line of choice. 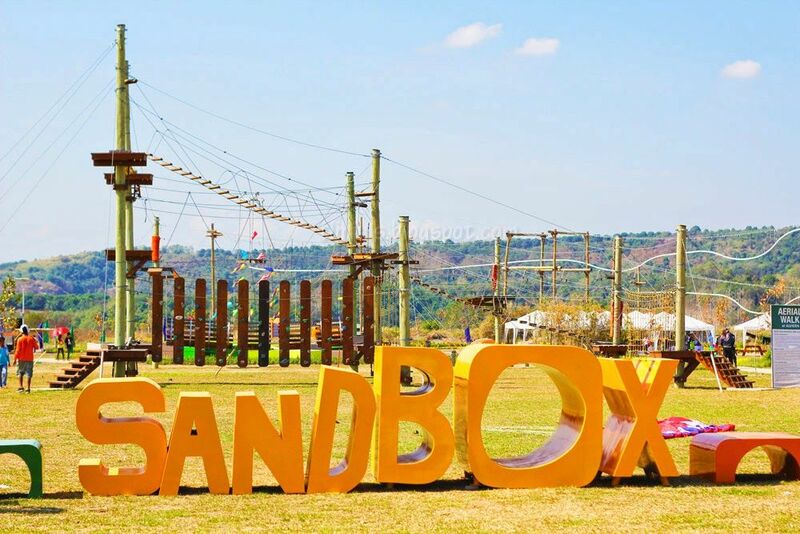 If you are looking to indulge your proclivity for thrill-seeking activities, then you should definitely head to The Sandbox located in Alviera, Porac. Adrenaline junkies and adventure enthusiasts will love The Sandbox as there is a myriad of activities to do and a variety of attractions to see. It takes fun seriously and will truly get your adrenaline running. The park features six attractions that are of varying degrees of thrill and excitement. Individuals who are looking for steady but active fun should try their hand at archery and maybe ATV and UTV rides. However, those who are looking for serious adventure might be more inclined to try the Adventure Tower. This attraction is a five-story structure that consists of an array of activities from wall climbing, rappelling to riding a roller coaster zip line. One of their main attractions is the giant swing which is raised more than three stories above the ground—making it the perfect play place for kids and kids at heart. Zipline fans are not left out as there is Avatar One which has been dubbed as the first roller coaster zipline in the country. However, those who are looking for a bit of a challenge might be more partial to the Aerial Walk which is a challenging course of ropes and nets raised above the ground. The Sandbox is located in the Municipality of Porac in Pampanga. To maximize your time and ensure that you get to try out all of the attractions, be sure to arrive early as the adventure park limits the number of people that get to use the attractions for safety reasons. Weekdays are the best days to visit as this means you can avoid long queues and throngs of people. Those who wish to try their hand at hydro sports or simply want to put their wakeboarding skills to the test should head over to Pradera Park. Perfect for adventure seekers and individuals with an affinity for watersports, Pradera Wake Park is an excellent destination for you to soak up the sun and water while strengthening your core by getting on a wakeboard. In this regard, city dwellers would no longer have to contend with going all the way to CamSur just for extreme fun when Pradera Wake Park is just a couple of hours away. The wake park is located amidst a vast golf course so those who do not want to get wet can alternatively opt to try golfing. Take a crash course in Filipino History by getting up close and personal with the relics of several Philippine historical and cultural sites. Back then, people can brush up on history and immerse themselves in culture in the now-defunct Nayong Pilipino in Pasay years back. 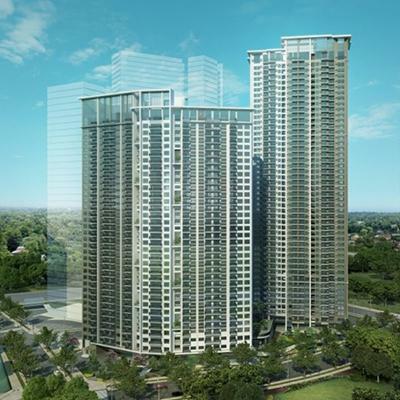 However, as the place is no longer in operation, the Nayong Pilipino in Clark reminiscent of the one in Pasay will have to do. If you wish to discover more about the Philippines’ history as well as explore its heritage, this is definitely one of the places you should include in your itinerary. Aside from showcasing what makes the Philippines truly the Philippines, the visit alone will inspire patriotic vibes from you. One of the best things about Pampanga is the fact that cultural treasures are not confined to what you can eat. In fact, snippets of the province’s history can be glimpsed through a walking tour. Take a stroll around the cities of San Fernando, Bacolor, and Angeles, and you will find a slew of intriguing heritage churches and houses. Several of these structures date back to the Spanish times and have been wonderfully preserved over time by their private owners as well as the government. This is, so the heritage of Pampanga remains tangible and visible for the new generations of Kapampangans and Filipinos to come. 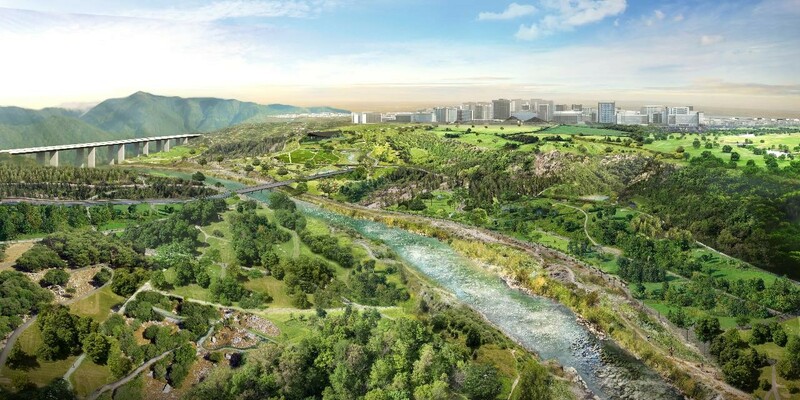 With the level of care, the Kapampangans took to retaining and conserving these sites, it is evident that they hold significant value and are pivotal structures that would allude to their history. Architectural heritages are of utmost importance to Kapampangans insomuch that even a church (San Guillermo Parish in Bacolor) that is half-buried in volcanic ashes has been preserved up to this day with priests still holding masses. Churches aside, Pampanga has several ancestral houses that line its streets. These very houses have seen several generations of families who have lived through its walls with some whose lineages date as far back to the Spanish era. Most of these houses are still in mint condition and offers an insight into what life was like back in the day. Individuals who have always dreamed of riding a horse can turn their dreams into reality in Pampanga’s El Kabayo. Considered as an outdoor adventure, albeit a laidback one, horseback riding is one of the unique things you can do in Pampanga. What makes the place beguiling is that it looks like a makeshift set for a Western-themed movie filmed in Hollywood. Indeed, this ranch feels just like your average old western American town that is sure to inspire that inner cowboy in you. Apart from horseback riding, the ranch offers an array activities perfect for families and groups of friends alike. Lessons are offered at the ranch for those who are wary of horseback riding or would need to brush up their skills. However, if you wish to simply relax and bask amidst the greenery, they have spaces fit for picnics and barbecues. If you have always held a certain fascination for being up in there, then Angeles City Flying Club should definitely make it to your travel itinerary. 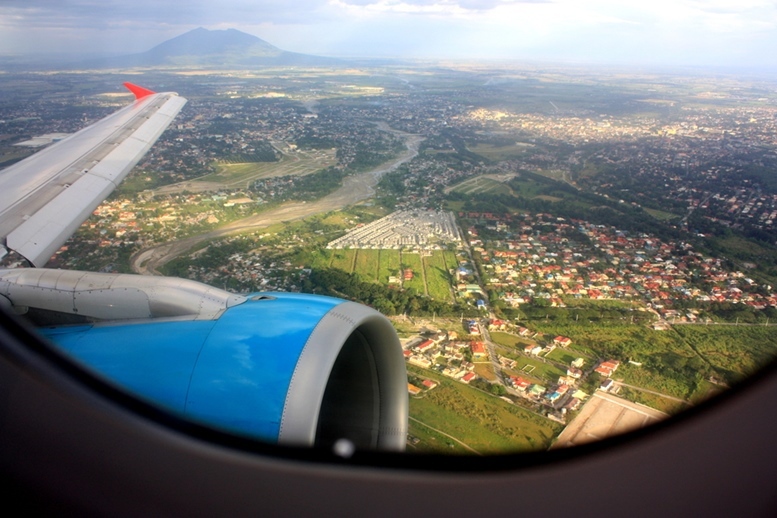 Similarly, individuals who wish to see the city from a different angle and on a higher altitude should try the Ultralight Flying experience offered by the Angeles City Flying Club. The tour consists of having you see Pampanga the way our feathered friends do all the while riding an ultralight aircraft in the company of a pilot for half an hour. If you are looking for a truly unique way to experience the province, then this is it. Apart from taking in the breathtaking and awe-inspiring views, the experience is definitely one for the books. After all, it is not every day that you get to see the world literally below your feet, so this might be an opportunity you do not want to miss. Go for a relaxing dip in Pampanga’s very own Puning Hot Springs where it is said that the soaking yourself in the waters of the spring is enough to release your stress. Puning Hot Springs is definitely not your typical day visiting the spring as the experience will be quite extraordinary. Apart from starting your journey with a bit of trek to get to this clandestine nirvana, it requires a 4X4 vehicle just to get to (rentable at the Sapang Bato gate in Clark Freeport). The ride itself is an adventure as the landscapes along your route will be some of the most picturesque and scenic views you will ever see and gives you a fresh perspective of the province. The site itself is divided into three sections with the third station consisting of eleven warm spring water pools where you can dip yourself into. After that, be ready to be buried in hot sand for at least 15-30 minutes—a treatment that is said to be good for your joints. To cap off your experience, guests will then be covered in mud to promote brighter and healthier skin. Families traveling with their tots in tow will be pleased to know that Pampanga has a kid-friendly and family attraction made with them in mind. 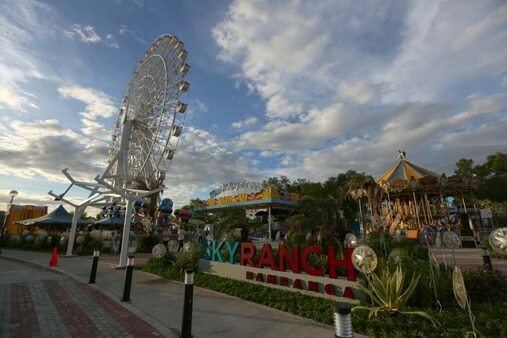 Families and individuals with a penchant for rides will love Sky Ranch Pampanga. Located in SM City Pampanga, this attraction is filled with rides that are sure to give you a healthy dose of adrenaline rush. Some of the rides you and your little kids can experience are Kangaroo Jump, Express Train, and the Double Decker Carousel. However, if you are looking for something that pushes your limits a bit further, you may want to hold on to your seat as your ride the Space Shuttle, Loop Roller Coaster or even go on the Bungee Jump. One of the theme park’s best-known rides is perhaps the Pampanga Eye which is said to be the biggest and tallest Ferris Wheel in the entire country—a feat that definitely merits a ride from visitors. You might have a difficult time picturing it out, but back in the day, the Philippines had operational trains and train stations. In this regard, visiting San Fernando’s very own Train Station might be a blast from the past insomuch that it might look like it came from a completely different time and in some ways, it did. Back in the day, the train station was fully functioning up to the Second World War It is said that even the Philippines’ national hero, Jose Rizal, had set foot in this train station when he visited Bacolor and San Fernando. Today, while the train station is no longer operative, it has a museum filled with memorabilia, photos, and statues to commemorate a grand time when it was once alive and busy. A Bataan death march marker to honor the people who had lost their lives during the Japanese occupation can also be found in the train station. Considering its pivotal historical significance, San Fernando Train Station has since been declared a historical landmark by the National Historical Institute which makes it a must-see attraction whenever you are in Pampanga. Catholics and non-Catholics alike should definitely make Arzobispado De Pampanga a part of their travel itinerary. Catholics can attend Sunday worship here while non-Catholics may simply wish to marvel at the magnificent structure as well as the fine architecture that can be observed in the place. 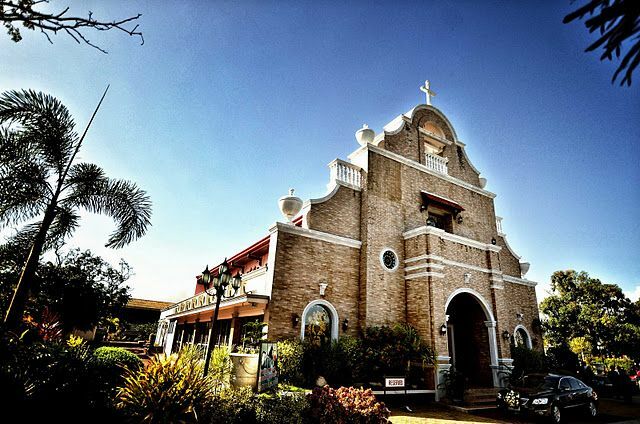 Arzobispado De Pampanga Church is one of the beautiful churches that attracts couples who wish to wed. So if the church is just along your route, you might want to check what makes it so appealing that it has been slated as one of the best churches to wed in Pampanga. Water babies should make it a point to visit Villa Alfredo’s in San Fernando City, Pampanga. It is the perfect weekend retreat for both families and groups of friends traveling. This water haven is an excellent way to spend the weekend splashing around the water and just having fun. You can swim around in one of the resort’s many swimming pools or even take it up a notch by trying out the water slides. Alternatively, guests who do not wish to get wet can simply relax and be at awe with the sprawling verdant greenery. You can even check out their exotic bird sanctuary, marine aquarium or botany garden. Kids and kids at heart will love San Fernando, Pampanga’s very own Trampoline Park. The Jump Yard Indoor Trampoline Park is definitely the place to be for families who wish to have an afternoon of fun with their kids or for athletically inclined individuals. The facility puts much emphasis on safety and precaution to mitigate the likelihood of accidents, so you are in good hands. The number of people who can go in the main trampoline area is controlled so as to lessen guests bumping into each other. While kids under five are allowed, they are only admitted in the toddler area. 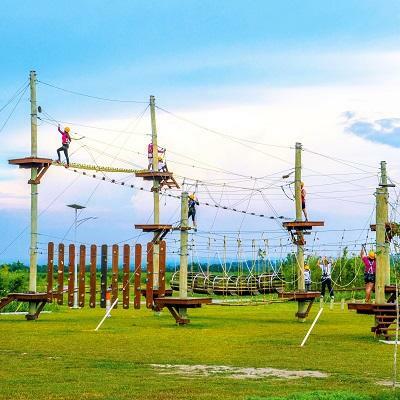 Apart from jumping up and down, there is a myriad of other activities to do such as bouncy basketball; climbing wall and the like making this one of the premier entertainment places in Pampanga. Cap off your trip to Pampanga by pampering and pandering yourself with a day booked at the spa. Before you head back, give yourself the chance to relax and unwind without digging too deep into your pockets. 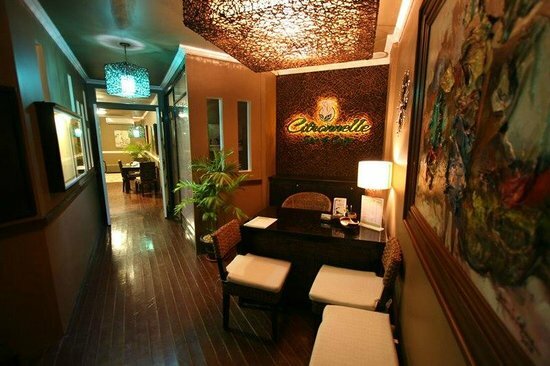 Surely, you will be winded and exhausted from the days of adventure you had in Pampanga, so head on over to the second floor of ESSEL Commercial Complex along MacArthur Highway where Citronelle Spa and Café is located. The massage rates are unbeatable starting at two hundred pesos for a relaxing one-hour massage. Apart from traditional massages, they offer other pampering services such as body and facial care treatments, waxing services as well as stream room access making it the perfect destination to end your trip with on a high note. Of course, a travel guide to Pampanga would not be complete without mentioning the best eateries you should visit. This is the culinary capital of the Philippines after all. For a more comprehensive Pampanga Food trip Guide, you can go here. However, if you wish to visit only a handful of Pampanga’s famed restaurants and eateries, here are five of the Kapampangan restaurants you ought to try while there. Estos Kitchen + Café is a relatively new Kapampangan restaurant that opened just two years ago. However, since its arrival, it has then gone on to become one of Pampanga’s beloved eateries and go-to places to wine and dine. Some of their best offers are their selections of scrumptious pizza with unique flavors like spinach artichoke and shawarma that are sure to pique your curiosity. Their beef tenderloin with chimichurri sauce is also said to be divine as it is served with egg yolk and umami rice finished off with just the right sprinkle of sesame seeds. Finish off your meal with the restaurants very own take of Taho ice cream and your dining experience will be complete. 25 seeds is a restaurant that found its home in an abandoned mansion built in the 1920s called the Dycaico Ancestral House. Today, the place is restored to its once-forgotten and original grandeur which makes the overall ambiance comfortable and contemporary but homey. The brainchild of owner and chef Sau Del Rosario, 25 Seeds offers a menu inspired by the East with offerings such as Duck Mango Soba with Bok Choy and the West like South of France-style Seabass et Papillote. Craving for a Korean meal while traveling? Worry not as Soo Hyang Restaurant has you covered. 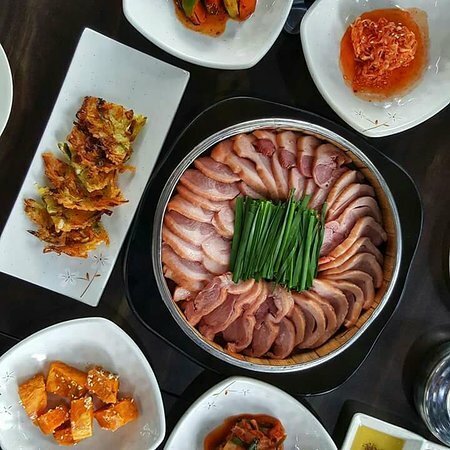 This restaurant and café fusion located in Clark serves traditional Korean dishes in a contemporary industrial ambiance. Some of their specialties include a whole roasted duck which can take 3 hours and 15 minutes to prepare, Haemul Pajeon and Japche. Of course, a Korean meal would not be complete without the Pat Bingsoo dessert. If you are looking for traditional home cooked Filipino meals and favorites, look no further than the Wooden Table. This place offers a variety of boodle selections that would be enough to feed groups of four or more. For individuals who wish to order ala carte meals, specialties such as crispy pata, Lechon manok, and laing are also offered. While Kapampangan cuisine may not be hard to find in Pampanga, you might want to try Binulo; a restaurant lauded for its authentic Kapampangan cuisine and US grilled steaks. The word binulo is the Aeta method of cooking food in fresh bamboo—a technique that the restaurant utilizes in some of their dishes. Some of their best dishes are the Paco Salad, Binulong Nasi, Binukadkad na Hito, and Pangat na Ulang. Be sure not to get too full though as you would not want to miss out on eating their Suman with mango ice cream for dessert. Now that you have an idea that Pampanga is more than just a place to go for food trips and culinary ventures, you might want to check out the other places you may have missed back then. As the place is only a couple of hours away by car, it makes the perfect destination for a spur-of-the-moment road trip this summer. So, gather everyone and pack your bags and commence your summer on a high note with one of the most exciting places in Luzon.